In the United States alone, concrete floors provide a different layer of class and elegance among building designers and ordinary homeowners. You can find concrete floors of distinctive designs (acid-stained, overlays, painted, microtoppings) in public and private places such as retail stores, offices, hospitals, basements and restaurants (Concrete Network, 2015). The major benefit of using a concrete floor is its affordability and durability. Concrete is a reasonable floor option in homes rather than linoleum, vinyl, ceramic or carpet. A concrete floor with a complex floor design is still less expensive than high-end wood, granite and marble. Even more affordable, is the beautiful stone or “pebble” concrete floor covering now provided by Vulcan! Maintenance is quick and easy with concrete (Concrete Network, 2015). In less than an hour depending on the size, you only need a dust mop to clean a properly sealed floor. Based on a 2012 survey conducted by the National Association of Home Builders (NAHB), concrete is the popular surface for outdoor area such as patios. It’s also used in driveways, pool decks, backyard kitchens, outdoor fireplaces and walkways. Stores, schools, hotels, hospitals, restaurants, offices and homes are the most common indoor places where concrete floors are found. You need to choose the best one that complements your taste or you experiment a combination of two. Listed below are the seven popular types used by homeowners, building owners and engineers. Terrazzo. It’s one of the oldest decorative flooring systems invented in the 1500s. It looks like a mosaic floor with embedding tiny pieces of marble or sometimes, granite (The Concrete Network, 2016). Ceramic Tile. The ceramic tile is the favorable option for flooring repairs (Do It Yourself, 2015). It’s made up of sand, natural products and clay molded into one (Home Fix Cos, 2016). Brick Pavers. It’s called paver because it refers to thin and flat stones used to enhance walkways, patios, and driveways. Saltillo Tile. It’s a lustrous floor tile made of clay, which is originally from Saltillo Coahuila, Mexico. Saltillo is one of the places known for its finest natural clay deposits (Santillo Tile, 2016). Marble. It’s a beautiful and durable stone existed since the civilization dawn. Marble is found in range of colors due to impurities (Nalboor, 2014). Slate. It’s a clay-like thin material that is tested and molded by heat and pressure (Stone World, 2005). It’s commonly used outdoors such as garden and poolside. Granite. It’s a common type of felsic igneous rock, which mainly consists of quartz, mica and feldspar. It’s popularly known for its durability and array of colors. Surveys reveal it remains as the top choice for kitchen countertops (MSI Stone, 2016). Vulcan Stone Flooring. Our stone floors prevent mold, mildew and moisture problems from occurring. It cleans easily with a vacuum or damp mop and never needs to be replaced. Vulcan stone flooring is the natural stone flooring choice to solve your concrete floor problems, permanently. Blisters are surface bumps that vary in size and time of appearance. It is well described as irregular shape, might be big in size, with fading paint. Crazing is a network pattern of fine cracks that don’t go through below the surface. The causes of its appearance are low humidity, high air temperature, extreme heat and drying wind (PCA, 1999). Curling refers to the deformation of a slab’s corners and edges. It occurs because of high-shrinkage concrete mix, improper control joint spacing and the use of thin slap edges. Delamination looks a lot like blisters. There’s bleeding of water and air trapped below the premature mortar surface. Its causes are cold substrate, high ambient air temperature and chloride-induced corrosion. Discoloration is the disgusting color change of a surface. The common causes are variation in concrete mix, irregular cleaning habit, vigorous troweling, insignificant amount of mineral admixture, imbalance in water-cement ratio and wet substrate. Dusting is the appearance of a fine and powdery material, which is the result of a thin and weak layer. A dust is composed of water, cement and fine particles. Its causes are incorrect water application, rainfall exposure, spreading out of dry cement, low cement content, wet concrete mix, lack of proper curing, concrete carbonation and dirt collective. Efflorescence is a type of discoloration, usually white in color. It’s caused by much soluble salts, much moisture, much humidity and pressure. Low spots are shallow and deep uneven surfaces found in garage. Common causes are poor lighting, improper set forms, damaged grade settings, extreme wet concrete and poor placement. Popout is a fragment that breaks a surface, which results to a small hole. Soft limestone and shale are prone to popouts, which is caused by alkali-silica reactivity (ASR) and moisture-induced swelling. Scaling is the vanishing of surface mortar, primarily caused by hydraulic pressure from water freezing. Spalling is the appearance of irregular oval shapes along the surface layers. It’s caused by internal pressure, weathering and fire. Stone Flooring is a floor enhancement product perfected by Vulcan Waterproofing. It’s made of top quality stones formulated with epoxy materials that allow any concrete type to breathe naturally. It guarantees no standing water too. It permanently solves concrete floor problems found in hallways, lobbies, pools, garages, play rooms, recreational rooms, basements and other high traffic areas such as offices, hospitals, parking lots etc. 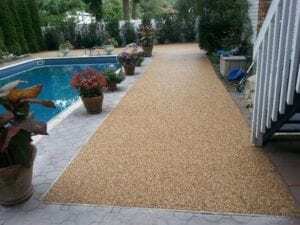 Wherever you are in the East Coast, stone flooring is available to all homeowners and commercial establishments in New York (Long Island and Staten Island too), Connecticut, New Jersey, Delaware and Pennsylvania.